Back in 2009, a crew of Toronto city workers painted a row of bike stencils and chevrons along the gutter lane where Dundas East crosses the Don River. These “sharrows” —lanes or “rows” that are shared by both motorized vehicles and non-motorized traffic—have since popped up around the city. Here at dandyhorse we’ve promoted the use of sharrows (see issues 1 and 3), albeit with reservations. We offered constructive criticism: they might work, we said, if they were more frequent on the road and if they could be painted directly beneath traffic lights. Some of what we said seems to have registered. Today, sharrows have become the preferred tool of the transportation department to mediate demands from cyclists for dedicated space on the road, and the insistence of motorists to maintain the status quo. The City was even considering a new application: a “floating sharrow” where the emblem would be painted twice. One marking for a rush-hour-lane sharrow and the another for non-peak hours, in the gutter lane, where cyclists would “share” with parked cars. At the City of Toronto’s recent open house (February 1) at Metro Hall, infrastructure plans for 2010 were showcased. “bicycle zone” of the road: that is, “as close to the curb as practicable,” as Ontario’s Highway Traffic Act puts it. By placing the markings at the gutter, Toronto is sending a clear message to cyclists to “share the lane”, leaving motorists out of the conversation. Sharrow markings in their original habitat of Portland, Oregon, are placed in the centre of the “car” lane. It’s clear in this confi guration that it is the driver who’s being reminded to share the road. When Toronto slaps sharrows down in the gutter, it sends a message to cyclist to be cautious, to beware. But cyclists don’t need to be told this. For crying out loud! So what’s the real message here? Bloor/Danforth has been in the sights of cycling advocates as a logical place for dedicated bike lanes for years: ARC (Advocacy for Respect for Cyclists) questioned its absence from the City’s Bicycle Master Plan in 2000, and a more recent movement has sprung up asking it be initiated in memory of the late Tooker Gomberg—a petition with well over 5,000 names curdles on City staffers’ desks—while another group, Bells on Bloor, has initiated an annual, family-friendly group ride from High Park into the city core that now draws thousands. The street was called out as the logical place for an east-west crosstown link in a report issued by Toronto’s Bicycle Transportation czar Daniel Egan as early as 1992. 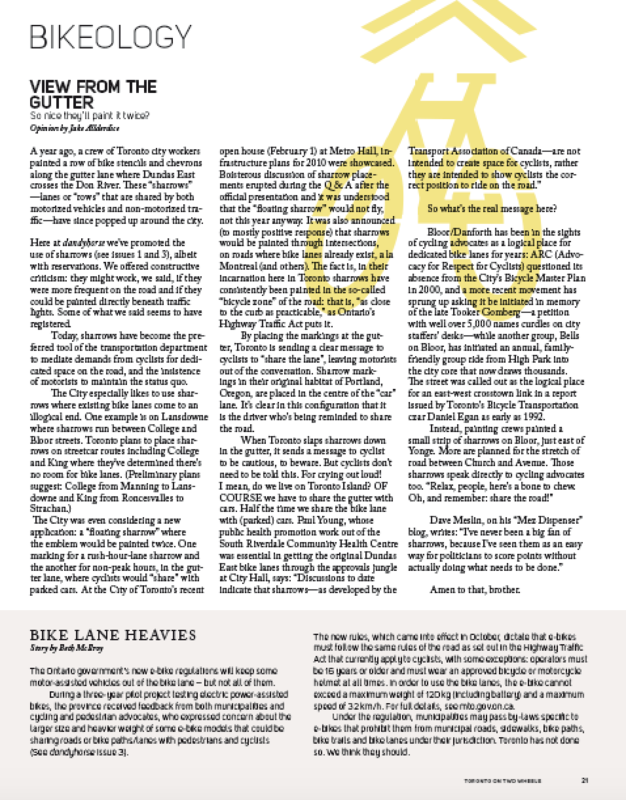 Dave Meslin, on his “Mez Dispenser” blog, writes: “I’ve never been a big fan of sharrows, because I’ve seen them as an easy way for politicians to score points without actually doing what needs to be done.” Amen to that, brother. Read the City of Toronto's updated information on sharrows here.